Camping Nord-Sam is a campsite with 100 touring pitches. 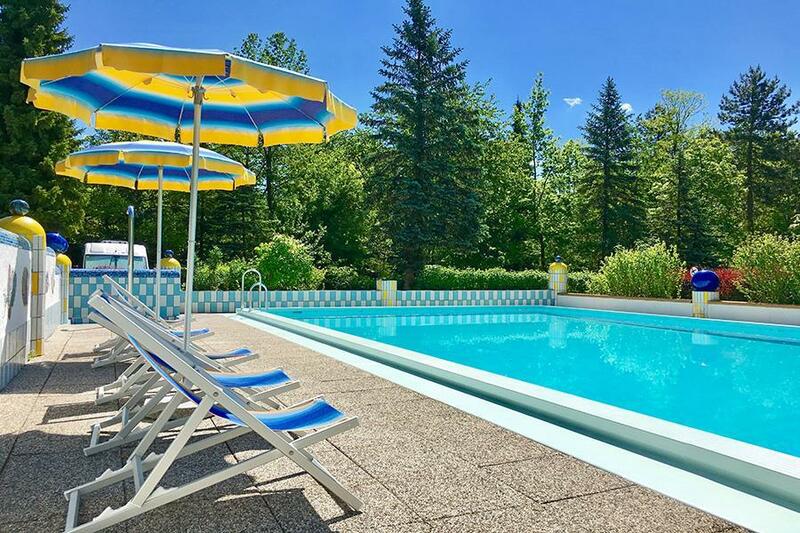 During low season, between 24-04-2019 - 01-06-2019 and 01-09-2019 - 06-10-2019, the nightly rate is €20,- at one of the 100 touring pitches at Camping Nord-Sam in Sam (Salzburg). At this campsite you can not only use your CampingCard ACSI for inexpensive camping, you can also use your ACSI Club ID (as an alternative ID). Attractively laid out campsite with plenty of shrubs and trees, located on the outskirts of Salzburg. Bus stop, cycle and foot paths 100m from the site which lead to the city or to the beautifully undulating Salzkammergut. Total conditions showers were good and services, but we are more sites and we paid less. The family owners of Camping Nord-Sam have obviously gone to some effort to create this attractive site on the outskirts of Salzburg. Reception seemed well organized, and the staff helpful and friendly. Even though the site was closed when we arrived, we were greeted, shown to a pitch and asked to check in later. Sunbeds were available at the good sized pool, which was lit at night, and there was also a play park for children. Bus tickets could be purchased from reception, and we were given a leaflet when checking in detailing how to use public transport to travel into Salzburg, along with prices and a timetable. The sanitary block had plenty of showers, but perhaps a little short of WC cubicles, of which there were only 4 serving a site with 100 touring pitches. Paper was provided in the cubicles, and the wash basins had soap and paper towels. The facilities were clean, although at least one of the seats was cracked. Pitches were mainly gravel and soil, though there was grass in places, and they were clearly marked out by hedges and trees. Some of the pitches were narrow, which made maneuvering our van into it a little difficult, as the roadway was also narrow with posts limiting the turning circle. Some pitches were better than others in this respect. A bus stop, supermarket, tabak, and an excellent Pizzeria (turn right out of the campsite, walk 200 metres and it's called "D&S" on Langmoosweg, which we can heartily recommend for quality, price and service) were all within close walking distance of the site, and the reception also sold essential items. Unfortunately, very expensive per night, we didn't consider the site to be good value for money, despite the location and facilities, and were disappointed to find that wifi (which was very poor on our pitch) was an additional €3 on top. At these prices we would not visit the campsite again, but it was, however, a pleasant stay. To travel to Salzburg, a ticket allowing 24 hours of public transport can be purchased for €3,40 (€1,70 for children) from reception. Other types of ticket are available, but this one suited our purpose. Turning left out of the campsite, the "Mauermannstraße" bus stop was just a few minutes walk away, and from here we took a number 23 bus to "Hauptbahnhof", where we switched to a bus taking us to "Makartplatz" (any bus going to "Zentrum" would have taken us where we needed to go). Campsite is located in an urban area on the edge of the city but very good access to/from the motorway. It is very convenient for access to the city as the bus stops outside the site. The site is compact, has a lot of tree cover and pitches are separated by some hedging. The water and waste points are central only. The toilet/shower block is recently renovated and spotlessly clean. the site is well maintained and the owners are friendly and helpful. Wifi was weak. The site has a small shop and fresh bread can be ordered daily. It does not have a restaurant but there is a pizza restaurant nearby - we were not keen on the look at first but when we tried it the food and the service was really good. Try it. As it is in an urban location it is quiet and no walks or places of interest nearby. There is a local supermarket. This is in a great location for exploring Salzburg and nearby or for an overnight stop. Recommended. Austria camps but Salzburg is a very touristy town, and so it is understandable a little crowd. The bathrooms are comfortable and with ample hot water. All in all I would recommend it. A bit expensive. 3 km away from the city? No, 3 km away from the train-station, where the only bus leading towards the camping stops! After that you have to take another bus that takes you to the center of the city. Very poor sanitary facilities for the number of campers, you will find just one sanitary group that is always full and not very clean. Unjustified high price/night, road works that woke you up with the noise of heavy machines at 7 in the morning, very poor lights on the alleys of the camping, small pool only for children. You can have at the reception "restaurant" a cup of coffee in the morning that has a higher price than in the center of the city! Don't expect a good coffee. If you came with a tent it's even worse, 2 areas allocated for tents where they stuck everybody no matter the size of your tent, so no privacy and no place to sit in front of your tent, at night bring a flashlight if you don't want to get in your neighbour's tent (no lights). Perfect for exploring Salzburg - just off the A1 motorway. Spar supermarket and Pizza Restaurant nearby as well as bus stop into the city centre. Excellent English spoken. Sanitary facilities are very clean. Would you like to book Camping Nord-Sam or request more information? You can do both using the information below or by visiting the campsite's website. A1 München-Wien (Vienna), exit 288 Salzburg-Nord. Filter to the left past 1st traffic lights and follow camping signs. 500 metres to the campsite. CampingCard ACSI will send your information request to "Camping Nord-Sam".